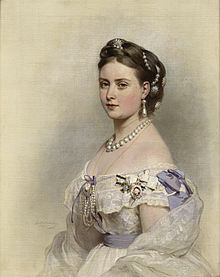 The Princess Victoria, Princess Royal (Victoria Adelaide Mary Louisa; 21 November 1840 – 5 August 1901) was the eldest child and daughter of Queen Victoria and Prince Albert. She was created Princess Royal of the United Kingdom in 1841. She became queen of Prussia and Empress of Germany in 1888 until her husband's Friedrich's death a few months later. Her son Wilhelm II of Germany became Emperor then. Empress Victoria died of breast cancer in Kronberg im Taunus, Germany, in August 1901, a few months after her mother's death. This page was last changed on 8 January 2018, at 05:02.